Challenges in Installation and Repair of Offshore Wind | PMI Ind. Installing and maintaining offshore wind turbines is an incredibly complex undertaking full of daunting logistical challenges. For starters, ships built to install turbines can cost $100 million or more. Stormy weather can delay installations and thwart repairs. 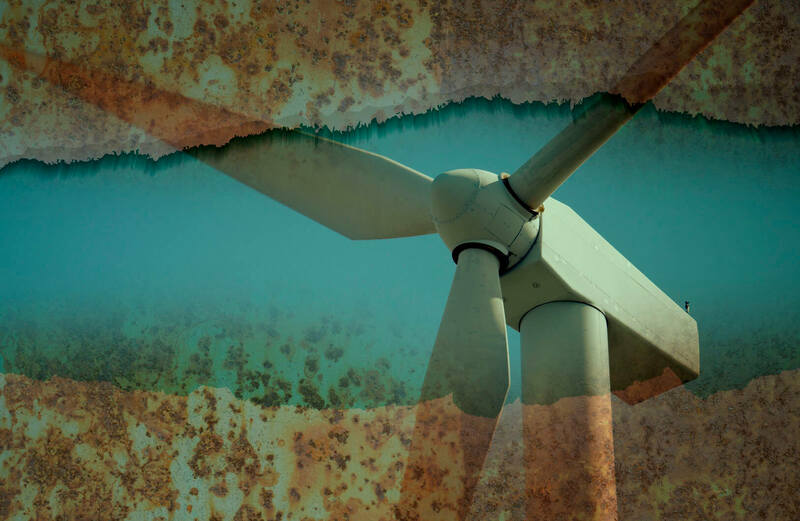 Weather and erosion exact a long-term cost on turbine blades, and turbine engines must be painstakingly designed for always on-operation for decades. Placing a foundation on the sea floor is a sophisticated, highly complex job. A gravity-base foundation uses a large volume of reinforced concrete and must be moved to a carefully prepared spot on the seafloor. All this requires specialized ocean vessels and specific expertise. Sea floors vary widely around the world. For instance, the sea bed off the coast of China is a lot different than the sea bed of European waters, so foundation expertise gained in Europe might not apply in China — adding to the complexity (and expense) of China’s ambitious offshore-wind agenda. Once the foundation is installed, it becomes vulnerable to saltwater corrosion and underwater species that attach themselves and may have to be eventually removed at considerable cost. Longer turbine blades produce much more energy than shorter ones, so the blades keep getting longer and longer as the offshore-wind industry evolves. Obviously, longer blades will create extra complications in transport and installation. But the bigger challenge is in maintenance. Blades suffer substantial erosion from constant exposure to the wind that decreases their efficiency. They often also suffer lightning strikes that cause considerable damage below the wind-facing surface. Turbine engines are large mechanical devices suspended high in the air. Installation is fairly straightforward because the offshore wind industry is so mature in European waters. But it’s still a non-trivial job to install a wind turbine engine in the open ocean because of the usual weather pressures. Because they run 24 hours a day for years on end, turbine engines must be carefully designed and manufactured to close tolerances to minimize breakdowns. An article in Forbes magazine likened running a wind turbine for 20 years to getting 3 million miles from a car engine. Turbine engines have lots of moving parts including bearings and gears that eventually wear out. This cannot be entirely avoided, but it can be monitored with increasingly sophisticated computer software that can predict when critical parts will fail, and allow them to be removed before they give out and cause serious damage to the machinery. The technology for laying transmission cables is mature and the techniques are well understood. At PMI, we’ve been building premium, high-performance subsea cable accessories for decades, so we’ve seen these developments up-close. The biggest maintenance challenges for transmission cables happen if they get snagged by ship anchors or fishing-trawler equipment, or if they’re damaged in subsea landslides. These mishaps require sending highly trained crews to the site of the break and fashioning a repair at sea. That will always be expensive and time-consuming. This places a lot of pressure on offshore-wind operators to find ways to reduce these kinds of costs. Using cheaper materials may be attractive in the short run, but if it adds to long-run maintenance costs, it’ll be a bad bargain because fixing things at sea is so much more complex.